Refining and petrochemical industries operate complex energy systems based on several steam pressure levels, with fired boilers producing highpressure steam and burning different fuels, and cogeneration units supplying steam and electricity to the site. The use of different fuels dealing with fuel gas production/consumption imbalances, electricity imports/exports with their corresponding commercial contracts, and finally having to comply with many environmental constraints provides several economic trade-offs to operate the site-wide energy system at minimum cost. Founded in 2005 as a result of the merger of Aconcagua and Bío Bío refining plants, ENAP Refinerías supplies more than 80% of the fuel requirements in Chile and also exports its production to Peru, Ecuador and Central America, complying with the most demanding standards in the world. Aconcagua refinery has a crude oil distillation capacity of 100 000 b/d. Its main units are, among others: the fractioning area (which includes topping and vacuum units, visbreaking, Merox and solvents plant); the cracking area (FCC, alkylation, SRU, LPG treatment, isomerisation plant); the hydrogen area (continuous reforming, MHC, HCK, HDT), DCU; and the utilities supply area. Aconcagua Refinery undertook an initiative to deploy a site-wide energy management system (EMS) tool for assisting managers and operators in the daily decisions they need to make for management of the utilities system. 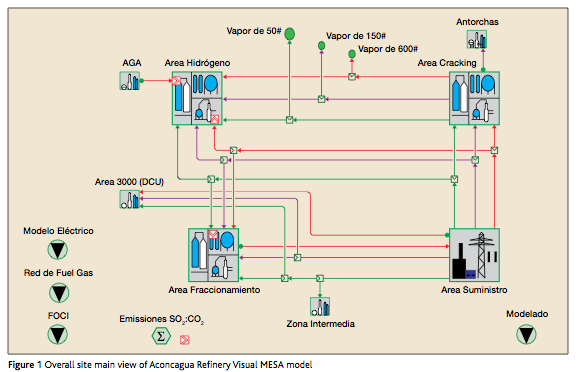 Soteica's Visual MESA Software, an industrial online, realtime EMS, was implemented with the purpose of helping Aconcagua refinery to reduce the operating costs of its utilities system. The software model developed not only gives recommendations on how to optimally manage the steam and electrical network, but also calculates energy-related key performance indicators (KPI), helping to identify operational gaps and emissions of both CO2 and SO2. The model can be used in standalone mode to perform case studies for economical evaluations of potential investments and for planning the operation of the utilities system. 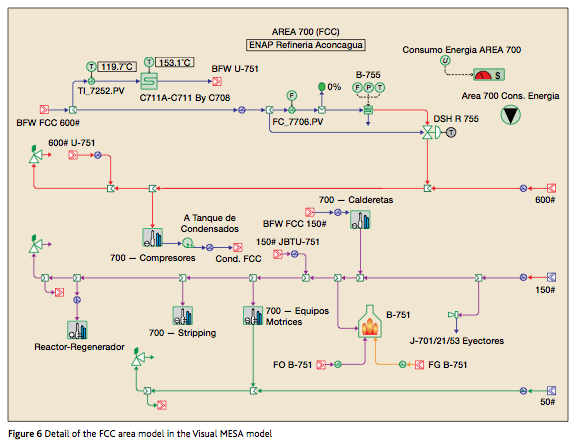 The energy system, the steps for the implementation of Visual MESA and several features of the model are described in this article, with a focus on the use of the software for the calculation of energy-related KPIs. The EMS implementation project is discussed and the main conclusions relative to the reduction in operating costs are also presented. Optimisation start-up: After the operators and engineers were trained, the recommendations started to be followed on a routine basis and the energy gaps were identified using the defined KPIs. The project documentation was provided and a benefits report was submitted. The energy system of Aconcagua refinery is based on four steam pressure levels. It includes five boilers, which produce high-pressure steam, and a set of turbogenerators producing electricity. A main view of the model can be seen in Figure 1. The site also operates dual heaters, which can burn fuel oil and fuel gas. Several potentially swappable electric/steam driver pairs and groups were identified and included. The built model was executed automatically and was continually fed with online, validated, real-time data. Its purpose was to produce recommendations in order to reduce the operative cost of the utilities system, respecting operational constraints such as minimum and maximum steam production, electrical power consumption limits and so on. In addition, the model could be used to perform case studies and evaluate the economic impact of potential investments and/or for planning the operation of the energy system in a given scenario. The economic trade-offs between electrical power, steam and fuel networks made it a difficult task to manage the utilities system in order to operate it at minimum cost. SO2 and NOx emission flows were taken into account in the model as part of the optimisation constraints, so no operative variable should be pushed to a point where these constraints are not met. Particularly in the case of emissions, they need to be calculated for monitoring, tracking and reduction in accordance with the Kyoto protocol. Optimisation variables were chosen among those where there is some freedom for manipulation during normal operation conditions. An example of continuous variables can be found in the steam production rate or the flow of fuels burnt in a boiler; there is free choice as long as the total steam demand is satisfied and the emission limits are respected. Examples of discrete variables are the swappable turbine or operation of the motor drives. Operating status of switchable steam/electric drivers (turbine/ motor swaps). Another group of variables must be defined to constrain the optimiser solutions inside a given feasibility envelope. These constrained variables are those that cannot be freely chosen by the optimiser but must be limited for practical operational reasons. For example, in the case of pump groups driven by electric and steam drivers, the constraint is the current power provided to the process (which must remain constant after optimisation), while the status of items of equipment are the optimisation variables. 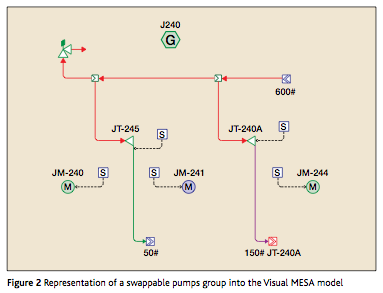 The Visual MESA representation of a swappable pump group can be seen in Figure 2. The white blocks with the "S" letter inside are status tags from the plant information system. They provide information about the on, off or unavailable status of a given driver. The set of recommendations produced in each automatic execution were shown in a customised Excel report (see Figure 3). 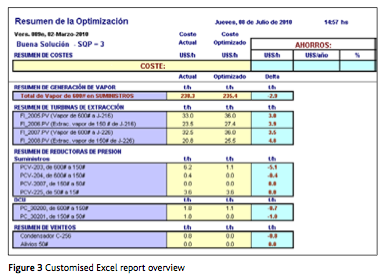 This output file summarised the values that variables had in the current operational situation and those values calculated to operate the utilities system at minimum cost. The economics of the optimisation — current operating cost, optimised cost, potential savings that could be captured by implementing the Visual MESA recommendations, incremental costs for the main variables and so on — were also displayed in the report. Since the report was based on Excel, it was easily distributed and shared among all users and also exported as a HTML file, to be browsed from the intranet. Besides the online optimisation tool developed for the site, several KPIs were calculated. 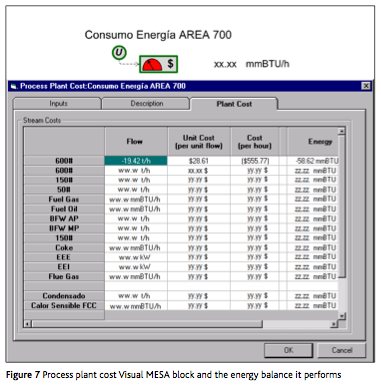 Taking advantage of Visual MESA's capabilities to work using live, online data, the energy consumption for each unit, or some special piece of equipment, was calculated and written back to the plant information system. The model has detailed information about the energy flows entering and leaving the units. The software also includes a special block that performs the conversion between material streams to its equivalent energy streams. By using this feature, the model calculated the overall energy consumption for the plants. This allowed the managers and engineers to compare the energy consumption for each one of the plants with reference values, monitoring and tracking their performance. Unit-level KPIs, which allow the site to analyse individual units or pieces of equipment. Information summarised by these metrics could be relevant not only for unit managers but also for technical specialists. Examples of these KPIs are plant area costs, boilers and heaters efficiencies, and use of energy per unit of production. 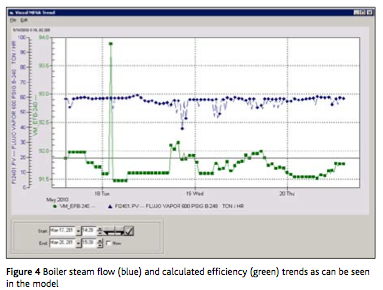 A trend for a boiler's calculated efficiency can be seen in Figure 4. All the metrics were created to be used as part of a site monitoring and targeting program, where actual performance is tracked continuously against targeted values. Savings were obtained by implementing corrective actions to improve these metrics. The two main types of KPIs currently being written back to the real-time database by Visual MESA are the overall energy system economics and the calculated efficiencies. Examples of other KPIs are gas turbine and heat recovery steam generation efficiencies and the gas turbine heat rate. The use of long-term trends helps in identifying the best time to clean equipment whose use of energy is becoming inefficient. For example, a trend for a calculated heat rate could be used to determine whether or not to clean a gas turbine compressor, as well as to detect operational problems. Mass imbalances in steam headers are calculated automatically by Visual MESA with a special block called a "balloon" and also historicised in the plant information database. These imbalances are sometimes related to sensor failures. A sudden change in the value of the imbalance would mean that the cause of this error should be identified. If the problem comes from an out-of-range signal, the sensor should be re-ranged. units. Thus, the different levels of detail can be visualised (see Figure 5). 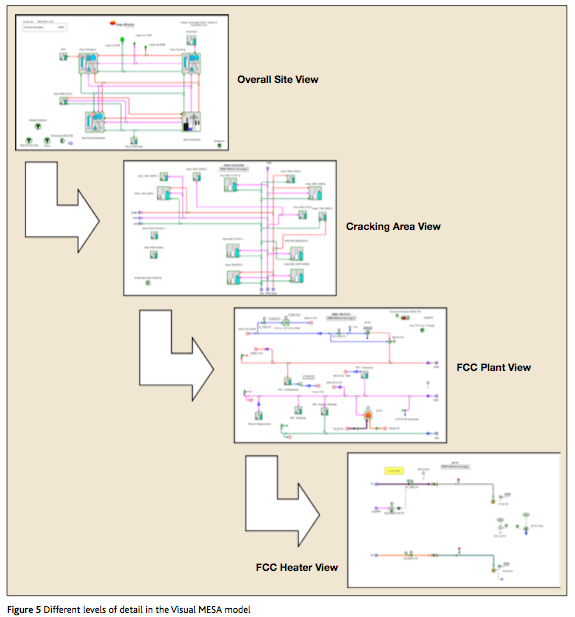 Taking a look at the software's representation of the FCC plant, the level of detail of the model can be appreciated. In Figure 6, the heaters, heat recovery steam generators, reactor-regenerator zone, compressors and several pieces of equipment have been modelled. Steam consumption in compressordriven turbines. All the streams that account for the energy balance are referenced inside the process plant cost block. This component is the key feature for performing energy balances on the units. The appearance of such a component and the balances it performs can be seen in Figure 7. The rectangle with the green edge is the process plant cost block. The circle with the "U" letter is the sensor that writes to the plant information system the calculated value of the KPI after each automatic execution of Visual MESA. By comparing this index with a reference value, the performance of the unit can be historicised and targeted. The customised Excel report includes a special sheet where all the calculated indexes can be displayed (see Figure 8). The optimisation routines built into the software, plus all the features included in the model, allowed the site to reduce its operating costs by running the utilities system in an optimal way and having a better understanding of how the different constraints interact among themselves. Savings were properly identified and actionable recommendations given to the operators. Like in other project implementations, as the software recommendations start to be followed by operators on a continuous basis, it is expected that the indentified potential savings start to decrease over time. Nevertheless, because the site's operating conditions normally change from time to time, there will be a moment when relatively big potential savings would be again automatically identified by the model. In such a case, a new set of recommendations will be produced and presented to the operators. If the new optimising actions are taken into account, the savings will be captured and the cycle starts again. Thus, the online energy management tool becomes a watchdog, advising operators on how to run the utilities system at all times. If the calculated cost reduction savings are consistently high, this should prompt management, supervision or engineering staff. A potential problem, to be identified, would not allow the proper actions to be implemented, thereby not allowing savings to decrease as expected. The implementation of an online EMS at ENAP Aconcagua Refinery has been presented. Energy cost reductions have been obtained, taking advantage of software functionality to suggest new operational set points for the utilities system and as a consequence of the KPI targeting program implemented at the site. A full model of the energy system has been developed. All of the constraints have been included and the model is continually being updated with live data. Visual MESA has proven to be a robust optimiser, capable of providing operating recommendations based on validated online data calculations. Energy-related KPIs were calculated and historicised on a continuous basis, helping to continuously monitor and reduce the refinery's overall energy gaps and operating costs. It is important to emphasise the high involvement and motivation of management and plant operators since the very beginning of the implementation project. Coordination among plant areas in order to implement the proposed optimisation recommendations is a critical issue, so management involvement was crucial. Nelson D, Roseme G, Delk S, Using Visual MESA to optimize refinery steam systems, AIChE Spring Meeting, Session T9013, Georgia, USA, 2000. Ruiz D, Ruiz C, Mamprin J, Depto. De EnergÍas Y Efluentes Petronor, Auditing and control of energy costs in a large refinery by using an on line tool, ERTC Asset Maximisation, Budapest, Hungary, 2005. Uztürk D, Franklin H D, Righi J M, Georgiou A T, Energy system real time optimization, NPRA Plant Automation and Decision Support Conference, Phoenix, USA, 2006. Department Procedes — Energie, Logistique, Utilities (Total Raffinerie De Feyzin, France), Mamprin J, Ruiz D, Ruiz D, Site wide energy cost reduction at TOTAL Feyzin Refinery, ERTC 12th Annual Meeting, Barcelona, Spain, 2007. Ruiz D, Ruiz C, Nelson D, Roseme G, Lázaro M, Sartaguda M, Reducing refinery energy costs, PTQ, Q1 2006, 103–105. Benedicto S, Garrote B, Ruiz D, Mamprin J, Ruiz C, Online energy management, PTQ, Q1 2007, 131–138. García Casas J M, Kihn M, Ruiz D, Ruiz C,The Use of an on-line model for energy site-wide costs minimisation, ERTC Asset Maximisation Conference, Rome, Italy, 2007. Ruiz D, Ruiz C, Nelson D, Online energy management, Hydrocarbon Engineering, Sept 2007, 60–68. Kihn M, Ruiz D, Ruiz C, García Nogales A, Online energy costs optimizer at petrochemical plant, Hydrocarbon Engineering, May 2008, 119–123. Serralunga F, Ruiz D, Ruiz C, Process Department Repsol Cartagena Refinery, Real time energy management at Repsol Cartagena Refinery, ERTC Asset Maximisation, Prague, Czech Republic, May 2009. Mariani D C, Kihn M, Ruiz C A, Industrial experience on the implementation of real time on line energy management systems in sugar and alcohol industry, 10th International Symposium on Process Systems Engineering — PSE2009, Salvador de Bahia, Brazil, Elsevier, Aug 2009. Ruiz D, Serralunga F, Ruiz C, Emissions and energy: an integral approach using an on-line energy management and optimization model, ERTC Annual Meeting Energy Workshop, Berlin, Germany, Nov 2009. Santollani O, Ruiz C, Real time energy management: some case studies, 4th Refining China Conference, Beijing, China, Mar 2010. Santollani O, Ruiz C, Real time energy and emissions management: some case studies, International Petroleum Refining, Jul 2010. Marcelo Galleguillos is Energy and Process Optimisation Division Manager of ENAP Aconcagua Refinery. He holds bachelor's degrees in mechanical, business, electronic and electrical engineering from Universidad Técnica Federico Santa Maria, and a DPA & Executive MBA degree from Universidad Adolfo Ibáñez, Escuela de Negocios, Chile. Rubén Monje is a Project Staff Engineer at Soteica. He has participated in several energy optimisation projects for refineries and petrochemical complexes. He holds a degree in chemical engineering from Universidad del Litoral, Argentina. Marcos Kihn is a Project Staff Engineer at Soteica. He has participated in energy optimisation and advance control projects for refineries, petrochemical complexes and for the sugar and alcohol industries. He holds a bachelor's degree in chemical engineering from Universidad del Litoral, Argentina. carlos Ruiz is Energy Management Systems Director at Soteica. Since 1994, he has led numerous projects related to model-based predictive control, optimisation of utilities and process systems, and the application of intelligent systems to process industries. He holds a degree in chemical engineering from Universidad Tecnológica, and master's and doctor's degrees in chemical engineering from Universidad del Sur, Argentina.